Eta Carinae, a hypergiant luminous blue variable star in the Carina constellation and one of the most massive and most luminous stars yet discovered, and the bipolar Homunculus Nebula which surrounds it. 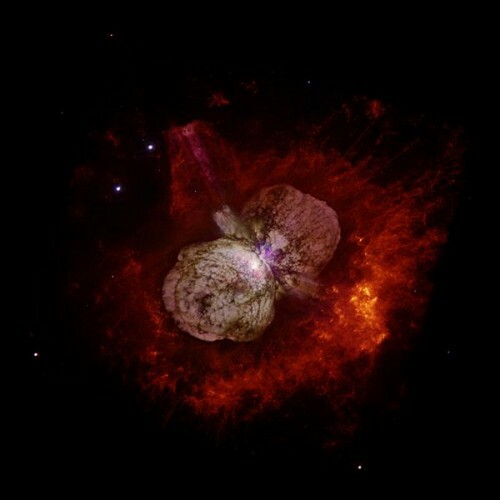 The nebula was partly created in an eruption of Eta Carinae, whose light reached Earth in 1843. Eta Carinae itself appears as the white patch near the center of the image, where the 2 lobes of the Homunculus touch. @yawn: That was the first thing I thought of as well. Freak. @copypaiste: I wish. I am completely talent-less as an artist (mom and brother) or a musician (2 brothers and dad) or even a decent decorator(sis). I grew up in a house of music and art and could only appreciate it. I have a decent grasp of mathematics and philosophy, but I wouldn’t call it talent.